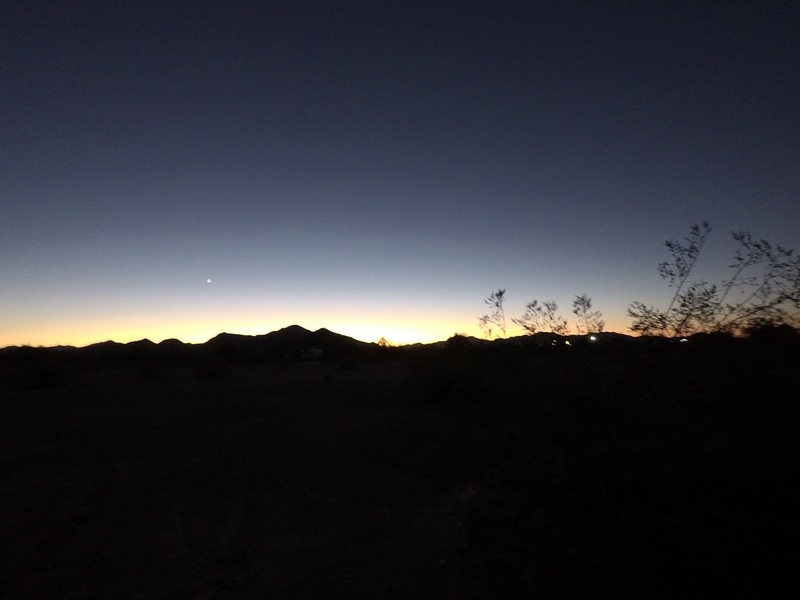 Good morning, we arrived in Quartzsite yesterday, we paid our $180 to cover us until April, and I explained we had never been here before so they were gracious enough to explain how it all worked. The most important point is not to leave Robbie unattended for even a moment as the coyotes here are apparently big and smart. We went down the highway to dump our tanks and load up with fresh water, drove to town for some spirits and reflectix and then returned to La Posa West to find our 14 day home. Got a really nice spot which offers us some sun protection although if we had the trees on the other side, we'd have more, a thought for another day. For right now, we just want to relax and unwind from the chaos of driving for the last 7 weeks. The bonus here is that we can move whenever we want to a different spot within this camp or a different camp altogether as there are 7 within this system. I didn't notice until this morning but we are situated between the big Q on the hill and the highway, almost a direct line of sight... we have an awesome view out our main window of said Q. Its damn hot here during the day and damn cold at night. Well, in fairness to the night, we did have the Maxx fan running half the night. Today we might just wander across to the rig in the above picture and see what their story is. If they are up to being sociable that is. We have to lose some weight, remember that printer... and some other stuff, anyone know if I can just put it all in the provided dumpsters? Take note: that data cost is based on what we think we'll use but we don't know yet and may reduce it later. We paid $25 to dump once in NY. Unbelievable! Glad you are situated. Maybe you can rent a car for a day to see some sights in the area. That is unbelievable! We’re hoping to get some bikes tomorrow in Parker, AZ. We stayed in La Posa South last winter and totally enjoyed it because you have the all the Dump Station, Fresh Water and Trash. You can use that Permit in California, Arizona, New Mexico, Utah and Nevada so you can explore the area and not be bored. You might consider traveling with a Towed which will give you much more freedom. Brad wanted to go shopping for a new Vickie but I'm holding him off... just hurry.